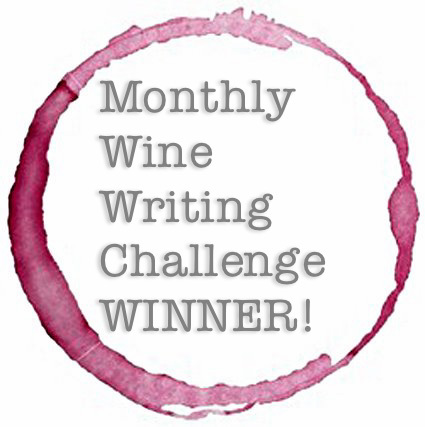 Earlier this month, The Drunken Cyclist issued a writing challenge to fellow vino bloggers. I love the idea, and the challenge. The inaugural theme/challenge is Transportation. The rules say I get to interpret that theme any way I want . . . as long as it involves wine. So stand by for interpretation. 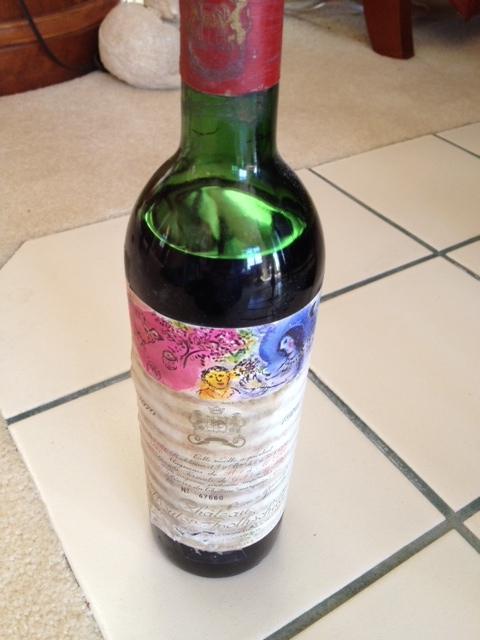 This is a bottle of 1970 Chateau Mouton Rothschild. It lived in my parents’ wine cellar for 20 years. Before that, it lived in Bavaria — in Opa’s (my husband’s grandfather) basement cellar. Opa gave it to my parents on one of our trips to Germany. How it arrived in Opa’s cellar is a mystery . . . provenance unknown. And so this beautiful bottle of history sat, in my parents’ wine cellar, waiting for an occasion special enough to open it. Births, deaths and anniversaries passed, and the bottle remained unopened. And then, last summer, my folks decided that all of us being together was the special occasion . . . so we opened it! Best special occasion ever. (And this only reinforces my idea that Tuesday is a good reason to open a bottle of Champagne!). One of my favorite things about wine is how it gets all tangled up with history. If you’re lucky (or patient) enough to have older bottles of wine in your cellar, it’s fun and a little humbling to think about what was going on in the world at the time that wine was bottled. And so, as we went through the anticipation and ceremony of opening a bottle of 1970 Chateau Mouton Rothschild (and tried to act like we’d done this before), we thought about the world in 1970. And this wine moved me. No wait. It transported me. Voila! There’s the tie-in. I was transported me to another time. A time when . . . Phones had cords. And dials. My parents drove a VW Squareback. A bunch of Brady’s were on TV. Tupperware came in these colors. The US & South Vietnam attacked into Cambodia. Jimi Hendrix died from a drug overdose. OH! And 1970 was the year of my birth. 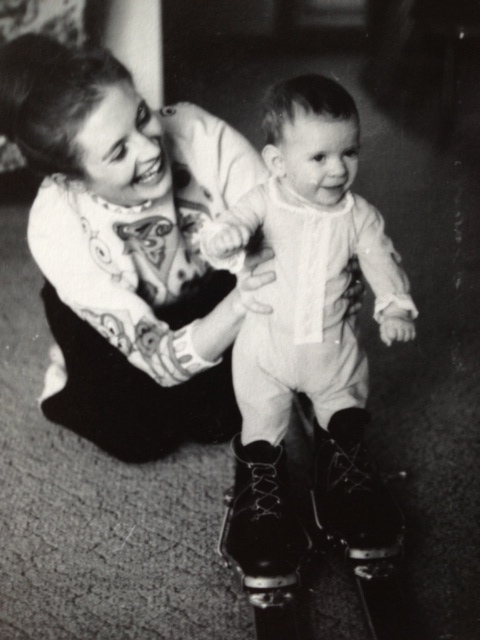 Here I am with my mom, taking my dad’s cross-country skis for a spin. And so . . . with all that thought, it was time to open and taste 1970. The label had seen better days — it looked so faded it was tough not to imagine it spent at least some time in the sun/light. Egad. Would you get a load of the ullage on this wine? Ullage is a great word — fun to say, too. 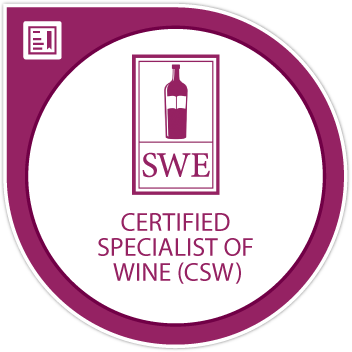 Ullage is simply the loss of wine in a bottle due to evaporation — corks aren’t 100% airtight. I’d call it high-to-mid shoulder — I’m told that’s pretty normal for a wine that’s over 40 years old. I don’t have a lot of experience opening older wines, especially not wines that say Chateau Mouton Rothschild on the label. The foil looked a little iffy to me, but I wasn’t going to judge a wine by its cover. The cork was a smidge dusty/mildewy under that foil, but we remained optimistic. 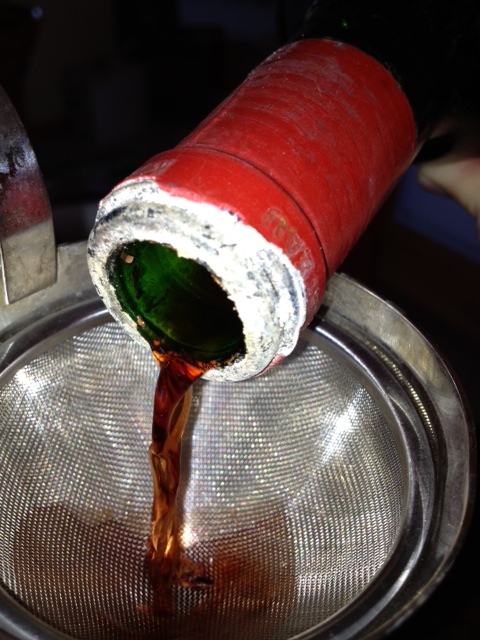 When we pulled the cork, it was completely saturated. Optimism waning. Please don’t be vinegar. Please don’t be vinegar. Please don’t be vinegar. I was a dope and didn’t take pictures of the wine in a glass. But hopefully you can see from the photo that the wine was a beautiful brick-coffee color. I’m calling it beautiful because I’m still holding out hope here that the wine isn’t corked. Tasting Notes: The good news is it’s not vinegar. It’s still wine. But it’s definitely lost a lot of its grip. Is it corked? Hard to say. I don’t get any of the telltale grandma’s basement smell that goes along with a corked wine. The nose on this bottle is meat and leather — in spades. Not entirely off-putting. The flavors are faint — raisin and caramel. Prunes, maybe. The structure is crumbling, with weak tannins and a faint finish. Ultimately, I couldn’t decide whether this wine was corked. I suspect it was, and I just didn’t want it to be. But corked or not corked, this was one of the best wines I’ve ever tasted. Not because it was a mind-blowing 100 point wine, but because it tasted like history. In an evening of laughter and memories with my family, we raised a glass to Opa and to 1970. It doesn’t get better than that. What a wonderful experience!! And a great read, as always! Thanks for sharing. Thanks, Oliver . . . Prost! Not only was the wine transported from house to house to house, it brought with it some fun memories. Great interpretation of the theme. Thanks, Patty . . . Salud! Great interpretation of the theme. What a wonderful read! Thanks, Julian . . . Prost! Excellent! What a great story and a wonderful piece! I am with you—when I open an older bottle of wine, I am openly hoping that the wine is fantastic. Even if the wine isn’t great, I still consider the experience to be fantastic….. Thanks, Jeff! Wine and experience are woven together tighter than Kevlar . . . Salud! I agree with everyone, great great story, a real privilege to taste a wine that old, even if there is some degradation it’s still a wonderful experience. Congratulations! Thanks, Anatoli! And I still don’t know how we managed to pull that cork out without breaking it! Salute! I totally second Oliver’s comment: a wonderful experience, a cool trip to a sometimes scary past (I mean, yes of course the clothes were flashy and weird, but do you want to even start talking about the hairdos?!? ), and as always a great read. Thanks so much, Stefano! Salute!! Gracias, amiga . . . Salud! I loved your take on transportation, and your evaluation of the wine. 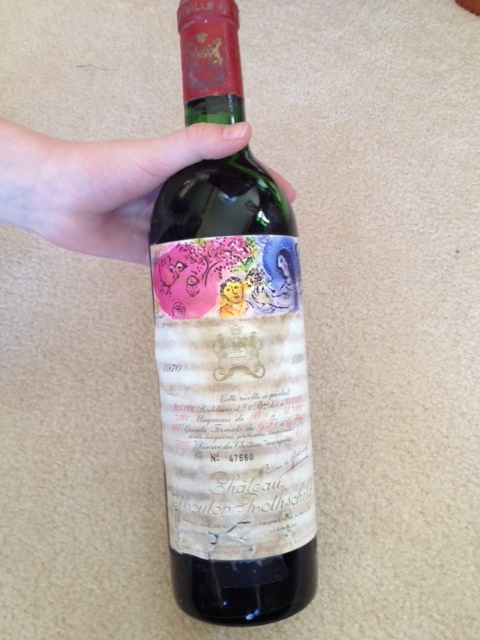 Memorable evening with your family – easily worth a 1970 Mouton Rothschild. Thanks so much, FWC! So glad to have you stop by!! Salud!! Thanks so much PFW! A ’77Chateauneuf? That must have been fabulous!! Salud! Alas, not really 🙂 I blogged about it if you wanted a read. Have a great weekend – Cheers! I witnessed a similar experience at a friend’s rehearsal dinner. His parents presented a bottle of Champagne they saved from the year he was born. It was a brown colored syrup that nobody would try!